Maritime tensions have remained high on the Asian security agenda after the 2011 East Asia Summit and ASEAN Regional Forum. Crisis and Confidence: major powers and maritime security in Indo-Pacific Asia, warns of the risks of war in the South China Sea and other regional waters. 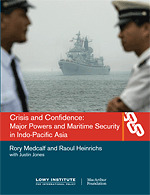 It examines the drivers of Asia’s maritime ‘crisis of confidence’, including clashes of sovereignty, national pride and military strategy. It concludes with a modest and realistic set of ‘confidence-building’ recommendations to avert conflict at sea. The sea lanes of Indo-Pacific Asia are becoming more crowded, contested and vulnerable to armed strife. There is a risk of incidents escalating to confrontation or even conflict. The region urgently needs direct channels of operational communication, especially between the Chinese navy and other navies. The sea lanes of Indo-Pacific Asia are becoming more crowded, contested and vulnerable to armed strife. Naval and air forces are being strengthened amid shifting balances of economic and strategic weight. The changing deterrence and warfighting strategies of China, the United States and Japan involve expanded maritime patrolling and intrusive surveillance, bringing an uncertain mix of stabilising and destabilising effects. Nationalism and resource needs, meanwhile, are reinforcing the value of territorial claims in the East and South China seas, making maritime sovereignty disputes harder to manage. Chinese forces continue to show troubling signs of assertiveness at sea, though there is debate about the origins or extent of such moves. All of these factors are making Asia a danger zone for incidents at sea: close-range encounters involving vessels and aircraft from competing powers, typically in sensitive or contested zones. While the chance that such incidents will lead to major military clashes should not be overstated, the drivers are likely to persist and intensify. For now, the risk of major-power conflict arising from maritime incidents is centred on China’s frictions with the United States, Japan and other nations in East Asia. But maritime tensions could reach across the wider Indo- Pacific region, as the power and interests of China and India expand. The region is ill-prepared to cope to with the perils arising from incidents at sea. Asia’s infrastructure of maritime confidence-building measures (CBMs) – such as military dialogues, real-time communication channels and formalised ‘rules of the road’ – is generally flimsy and little-used.